Friday and Saturday I visited the Arnhem Fair with my friend. We had a fantastic time and were able to see and buy a few wonderful miniatures. 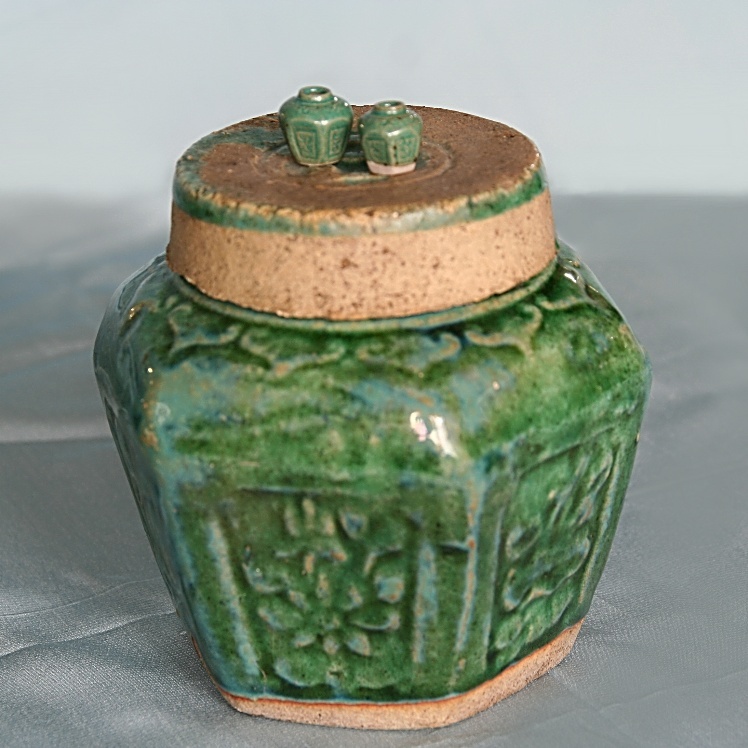 In the weeks to come I will show some of the things I bought, starting today with some lovely ginger jars. Over the years I have collected a few full scale ginger pots. They're not precious antiques as they were shipped into Holland by the thousands. In fact, I think you can still buy ginger in these jars. But they're very decorative and I love the green glazes on them. From the early 1900's they are frequently used by Dutch artists in still lifes, Vincent van Gogh being one of them. 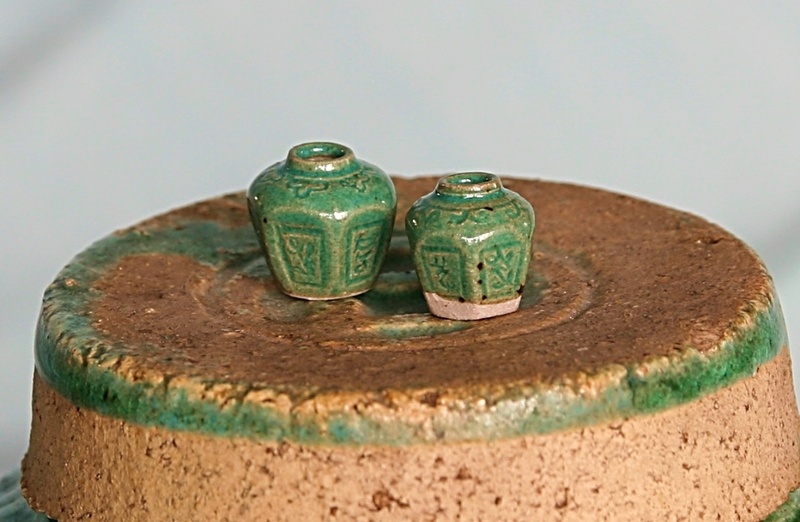 At the request of a Dutch miniaturist, French miniature potter Elisabeth Causeret (Poterie Miniature) made ginger pots in miniature. She did a fantastic job, the glazes are so good! Elisabeth made the pots without a lid and this is how you'll find most of them. The ginger pots were closed with a large cork which was sealed with wax. To find one with a lid is quite uncommon. 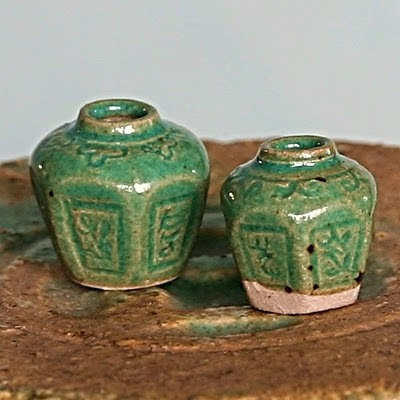 I love how the miniature pots have imperfections in the glazes, just like the big ones! When my friend and I came to Elisabeths stall on Saturday, she only had four ginger pots left, two for my friend and two for me. I hope she'll have a few more at the next fair so I can have a small collection of them, just like I do in real life. what a show! they are fantastic miniatures, I no I have never seen anything like it! even the great vessels are very beautiful! Congratulations on your excellent purchase. hope to expand soon your beautiful collection! Que fantastica compra, son unas miniaturas maravillosas!!!! Oh, my heart almost stopped just looking at these gorgeous things! They are some of the most beautiful miniatures I've ever seen! Stunning. Gemberpotten zijn prachtig. De groene kleur en reliëf. How funny to see this on your blog.....guess what I bought at the fair this weekend!! I also got an "jeneverfles" from her. Although I don't like to drink it....I had to have a bottle of it. They are amazing, you'll have a fine collection one day hopefully, to grace one of your scenes. Gosh, they are beautiful, Josje, those colors are perfect. As you may know, I like collections too ;-)Do you have a link for a website of hers? They are beautiful Josje! I really love her pottery. Sadly, she doesn't seem to have a web site and I don't think she comes to the shows in the USA. I look forward to seeing the other things you bought at the show. 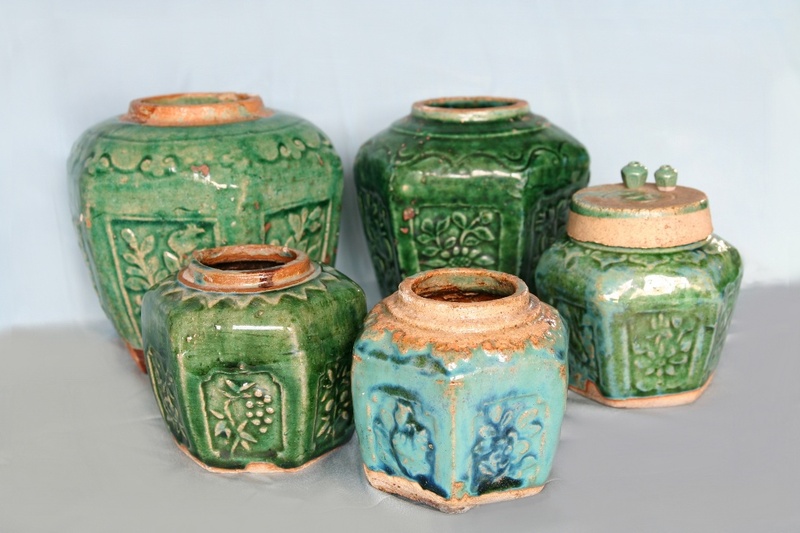 Your ginger pots are gorgeus, both the big and small ones! I love Elisabeth Causeret's work and am so lucky to have four lovely vases made by her, which I bought at SIMP. I usually buy some of Elisabeths pieces at each of the Arnhem fairs, so I have several of her pieces already, but these new ginger pots are so lovely! @Jeffry: We were late (as usual) but Louise Meertens told us about the ginger pots, so we hurried to Elisabeths stall where of course YOU already bought most of them, haha. @Susanna: Unfortunately Elisabeth does not have a website. Some American websites do sell her work, but I'm sure it would be more expensive that way. If you save all the shipping costs, you could probably buy a train/plane ticket once in a while to visit Arnhem or Paris ;) If there is something you really want and can't get where you live, let me know next time and I'll see if I can get it for you at the next fair (March). Wat een prachtige aankopen Josje.....jammerd dat we elkaar weer niet hebben ontmoet! Gelukkig komen er meer beurzen dus het gaat vast een keer lukken,haha! Ik heb mijn ogen weer uitgekeken en heb een fantastische dag gehad. Ik ben benieuwd naar de rest van je aankopen, jou kenende zijn het vast hele mooie aankopen, net als deze mooie potten! Oh, the pots are so fine, so delightful!! Elisabeth Causeret did a great job, I like her work very much. I'm glad you managed to buy them. Elisabeth did a fantastic job on them.....the glaze color is perfect! How great that you were able to buy a couple of them!! What treasures!